Detailing the physical features, habits, territorial reach and other identifying qualities of the Bold Medicine Moth. Bright colors and a high gloss finish on the Bold Medicine Moth are remarkable, but this tiny flier is still mostly a mystery. The Bold Medicine Moth's name origin is unknown. The unmistakable colors on the wings of this moth may account for part of its moniker. 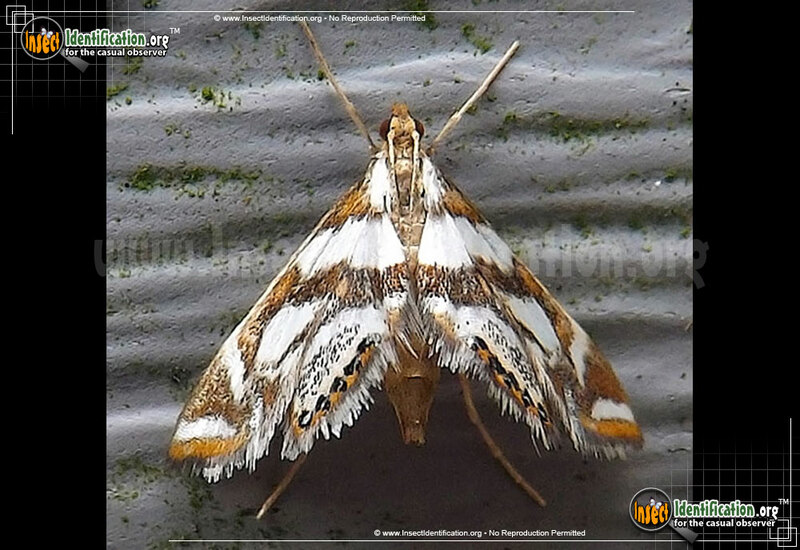 This orange and white moth is small, but its visual impact is large. A glassy reflection covers the moth, giving it a sheen best seen from oblique viewpoints. The orange-brown color on the forewings is interrupted by a white band that crosses the upper part of the wings and large white spots and dashes on the lower part of the forewings. The hindwings are often visible when at rest with wings flat, and each has a large white circle on the bottom edge that is speckled with dark spots in the center. The hindwings also have a black, white, and orange checkered bottom edge. All the wings have a long, wispy white fringe. Information regarding the life history, diet, and larvae is still unknown. More research is needed to get a full look into this shiny gem.